Hilliard Davidson senior, Ellie Tighe shown competing at last year's SPIRE Showcase. The squad from Hilliard Davidson were among Ohio's contingent who made the trek over to Liberty University last weekend to compete at one of the country's most prestigious meets, the VA Showcase. MileSplit tracked down Hilliard Davidson coach, Nathan King for insight on how his athletes performed. "The VA Showcase did not disappoint. It was our first real series of races in 2019 and we relished the opportunity to be pushed by east coast teams who've already started their indoor seasons and place a heavier focus on indoor than Midwest teams." 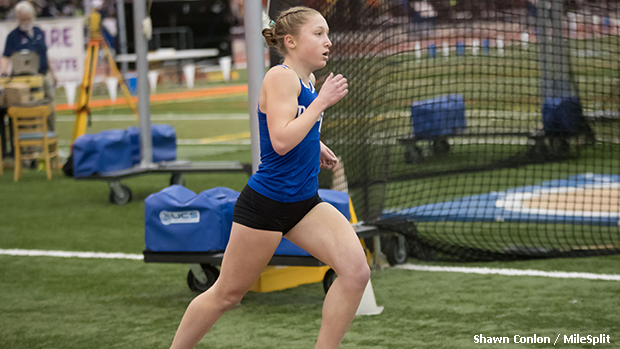 "As a program, we put an emphasis on the 1600m, and Ellie Tighe's 5:08 converted 1600 was outstanding as well as a validation of her winter of work." "We were able to run NBNI qualifying marks for the 4 x Mile which we are excited to pursue again this year after placing third in 2018." "Also, Sophie Lewis and Lindsay Stull were able to test their mid-distance chops in a brand new event for them, the 1K." "A highlight from the younger side of the team would be Alyssa Mason, a freshman who ran giant PR's in the 1600 (5:38) and 3200 (12:31)." "We really enjoyed the opportunity for all ability levels to be challenged by strong competition at the VA Showcase." Day 1 VA Showcase highlights: massive 1600 PR from freshman Alyssa Mason in 5:38 and Dayton-bound senior Ellie Tighe PRs as well with a 5:10 full mile. Junior Sophia Hoersten runs a 38 sec PR for 11:30.5 in the 3200! OH#2! Ellie Tighe continuing to define hard work and chasing *improvement* above all else. 12th - 5:08...fastest 1600m in Ohio right now. Growth mindset like hers is as exciting to a coach as any title or victory.